On being called up one by one to the start line, the sea still seemed plenty choppy to me. I lined up next to Eimear Mullen, who I knew should be a good set of feet to target. I have been working on my swim start; that mad dog fight to the first buoy and for once, felt happy that I had maintained a good position. However, shortly after the first buoy we were going straight into the sun. It was also hard to see anything over the chop, so when I decided the feet I was on were too slow, and moved round to come past, I was a bit gutted to realize they had lost contact with the group and I was no in no man’s land. Cue a lot of sighting and some dubious navigation! I often find sea swims a bit difficult and I found it hard going on my back and neck, with all the bobbing about. Once out on the bike, the price to be paid for the sea swim became evident as my back went into spasm early up the first hill. This is not what I had had in mind for my first outing in an elite GB suit! Maybe it would settle down. By 10km, I was in tears and all negativity has set in. This new course, with 1200m of gradual climbing suits me perfectly, and I was so frustrated that I cannot apply pressure to the pedals and get to work to try and reel a few swimmers back in. As I was crawling up to the top of the first climb at 20km, Matt overtook me and, with some words of encouragement, I decided to try to keep him in sight down the first descent, enough to follow his line whilst my back took a rest. As I reached the bottom, where the out-and-back section ended, before the circuit commenced, there lay my opportunity to call it a day. I didn’t think I can tolerate this back pain for another 60km? I felt I must be so far behind by this time that I’d be out of the game, so what was the point of carrying on? 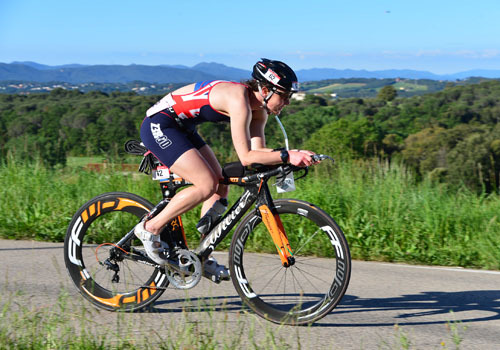 Then I thought about waking up the next day to go home, having DNF’d and having to tell all the friends, family, work colleagues and many other supporters back home, that I gave up racing in a GB suit at this ETU Championship event. Even the idea of being back at the race venue and watching everyone else run whilst I skulk off to the hotel made my stomach flip… No way! There was also the small matter of getting back over said hill in any case. I resolved to keep going as best as I could and make the most of the descents whilst my back rested. I even managed to overtake a motorbike! You could hear the race HQ before you ever enter back into Calella. As I left T2, there was a smile on my face as my back complies, and seeing the crowds lining the course gave me a lift. I had been working hard on my run this winter, the weakest discipline for me and I wanted to see what I could do to pull the race back. I focussed on cadence, relaxing the shoulders, lifting the heals – all the technique I had been working on. The kilometres ticked past and what a buzz it was to see some of the iconic names of this sport like Gomez and Macca, flying past in the opposite direction. Also, I saw some other pro girls and realized that I was far from last and they didn’t look like they would catch me. “Get to work, Haresign, there is still a race to race for!” I said to myself. I dug in – fuel, form, strong, staying tough. I passed a couple of familiar faces coming the other way and they, along with the ‘come on, GB!’ from the sidelines, all kept me going and reminded me that this experience was what I came for: to test myself against the best, and to learn something about myself and my triathlon: where I have got to, but also see where I believe I can still aspire to reach. I know I have plenty to go away and work on (some sea swims planned for the summer! ), but I know I gave it all I had on the day, and it would be a great experience to draw on next time things get tough.